It seems to me that most people spend their daily lives saying “yes” to everyone besides themselves – the society, parents, spouses, children, teachers… “When you say “yes” to others, make sure you’re not saying “no” to yourself.” Paulo Coelho. My daily work as a therapist nearly always brings me to one of our society’s greatest disease – lack of self-love. The roots of most our problems are usually hidden there. I don’t remember a single time from my childhood where someone told me how important it is to love myself. We’re taught since birth that we need to love our parents, grandparents, sisters and brothers. We need to behave so that other people would feel good and comfortable around us. We need to always consider the needs of others. No one has told us the importance of our internal dialogue. Parents don’t teach how and why we should always stay true to ourselves and that the most important thing in this life is to follow our own hearts. As children we aren’t told that to explore the world and find out who we really are. Express both our joy and sadness and our individuality regardless of how other people react to that. The society starts preparing people early enough so to be obedient and act only according to certain norms accepted by the society and live their lives by the rules that are set by others. We are told what to think, what to say, how to behave and what and who we should be. From the moment we’re born society starts giving us grades so that we would feel inadequate all the time. From the beginning we have “other-confidence” instead of “self-confidence”: when somebody other than us tells us that we’re adequate, good and beautiful then we believe them. We’re in constant need of external approval; we search for it wherever possible and become unhappy without it. Women construct themselves from “spare parts” like dolls and post several selfies a day to Facebook just to get approval of being beautiful. Men pump themselves up in the gym, hide their gray hairs and buy flashy cars. In reality though, everyone has huge hole inside. A hole that needs to be filled with love – love from ourselves. Most of us have grown up feeling that we’re not good enough and that we need to be nice and neat boys and girls to earn the love of our parents. Later we try to be good spouses to earn the love of our partners. Then later we try to be good parents to earn the love of our children. Why does love need earning? As if love was something there isn’t enough of and it’s spared only for the best of us. While actually love is an infinite resource, that can be shared everywhere and to each one, yet we keep tight with especially this resource. We are the most limiting when it comes to love towards ourselves. We have a hundred conditions for ourselves that we need to fill before we can love ourselves – that we need to match our ideal of perfect before we may love ourselves. Love and fear are two foundational feelings for human beings. All other feelings are based on these two. So when we don’t have love, we have fear. We live in a society where fear is generated on nearly each step. Every time we turn on the TV, radio, read the news on the internet or pick up the good old newspaper. All of this keeps generating fear in our consciousness. When we don’t have self love, we have fear and with fear we lack courage – courage to say “no” to people, moments, situations and things that don’t actually fit us and our hearts voice. We lack courage to pursue things in life that make us truly happy. How many of us can look in the mirror and say in all honesty that we have exactly the life we wished for ourselves. How many of us are still trying to prove to their parents and society that they are nice and neat and deserve love and approval. The lives of most people is one big compromise out of fear that maybe there’s nothing better for me so I dare not wait. I marry the first person who gives a bit more attention to me, I’ll take the first job I’m offered and hurry with getting kids before my body gets too old. This story might not be as dark for everyone, yet a big chunk of society lives their lives that way and others feel these kinds of fears breathing down on their necks. Life around us is an excellent reflection of our relationship with ourselves. When we’re not content with what’s going on around us then we need to sit down and look in the mirror. The external is only a sign to us that something is not right and we’re not living in harmony with ourselves, listening to our heart. Most people don’t even know what the voice of their hearts is let alone listen to it. What if starting from today we start saying “yes” to ourselves and “no” to everything that doesn’t serve me? The first step towards loving ourselves is to take time, think, feel and write down everything that takes us further away from ourselves and doesn’t make us feel good. Learning to love ourselves is a long journey which needs to be started step-by-step. When we understand what is unfit for us, only then can we start expressing it to others around us. It will likely start to cause confusion in our relationships with others. We might be considered egotistical and many relations might come to an end. Yet the people around us who don’t allow us space to be who we are shouldn’t be part of our lives. Of course it is always important to be mindful when we start expressing to others our "no"s, or our wants and needs. We should do it with as much love as possible while staying true to ourselves. We know that we don’t need somebody else’s approval or recognition to feel that we are enough and loved. When we start to fall in love with ourselves the holes inside will start to disappear. Self love will fill the holes of fear with love. We won’t need to fill them with relationships, food, alcohol, tobacco or shopping. We don’t need people and things in our life anymore to make us feel a certain way. Without fear, people and things will come to us by themselves. Needing only pushes people and situations away from us. Abundance of love will create more love, fear will create more fear and lacking. If we can’t love ourselves, we can’t really love others either. That which we consider to be love is rather far from true love, really… attachment, habit and desire are not love. Why don't we start our lives by first learning to love and get to know ourselves. Who I am, what I like and what would I like to have in my life. Do I want to make a career or be a nomadic musician? Could I be a mother or would I choose to not have kids in this life? This way we can learn to make choices that bring us closer to ourselves rather than take us further away. Only then will we get a chance to discover what we’re great at and what enables us to create more beauty in this world. 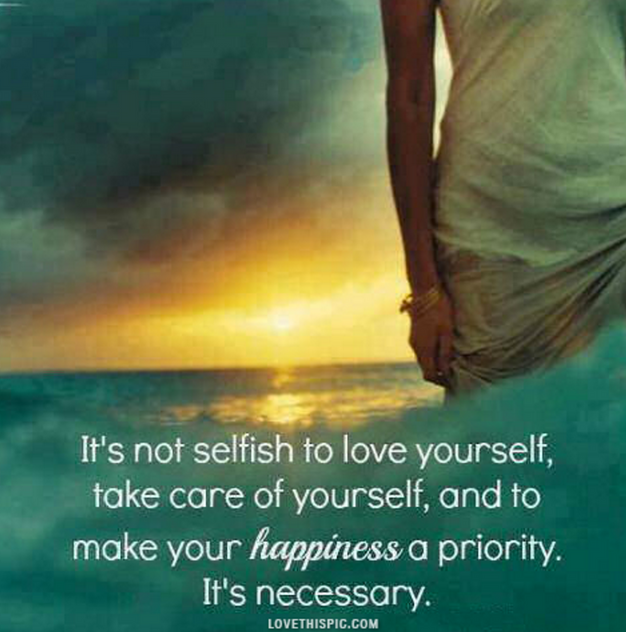 Remember: to only relationship that lasts a lifetime is with ourselves, so that is the one we need to work on the most.